In this world there are plenty of species that live an extremely long time, from land tortoises that can live up to 150 years, to some species of whale that can live as long as 400-600 years, and even some types of trees live to be several thousand years old. However there is nothing on this planet that Is a living creature that can live forever, or is there? Scientists have discovered a species of jellyfish that has the ability to be technically biologically “immortal”. There may be millions of different species on this planet, but still to think that something has the potential to never die is absurd, it sounds like science fiction. If there’s one thing that I’ve learned though, it’s that in science nothing is impossible. This species of immortal jellyfish is called turritopsis nutricula and it has the amazing ability to revert itself back to a state before it’s sexually mature when it is injured, sick, or threatened by predators. Let’s begin with some background information about this amazing jellyfish. This jelly fish is about 4.5mm and originates from the Caribbean, turritopsis nutricula tends to be found in warmer waters (ImmortalJellyfish.com). They tend to latch themselves on the bottom of boats which has led to them spreading to many different parts of the world. This has led to turritopsis nutricula to spread “to coastal waters along the United States and even as far north as Europe” (mom). Their diet mainly “consists of plankton, fish eggs and small mollusks” (ImmortalJellyfish.com). An adult jellyfish can have up to 90 tentacles while juveniles only have 8 (ImmortalJellyfish.com). This species was originally discovered in the 1880 but it wasn’t until recently (mid 1990s) that scientists discovered its ability to theoretically live forever (mnn.com). It is also important to note that these jellyfish technically have the ability to live forever but they can and do die quite easily. They are incredibly tiny and can be easily killed by a number of predators that use them as a source of food. However in perfect conditions without threat of predators it is technically possible for this species to live forever. What allows this species of jellyfish to live forever is the unbelievable ability they have to control their own cells and revert their body back to a state that is sexually immature. Let’s start with the birth of these jellyfish, they start out as eggs and after about two days hatch and begin life in the larva stage. Then they go into the polyp stage or basically when they are juvenile. This larva state is also the stage they revert themselves back to when they in danger of dying (animals). After about two weeks the jellyfish enters the medusa stage and is now mature and has the ability to revert itself back to larva stage. It’s been found that the warmer the water is the quicker this jellyfish develops out of the polyp stage and into its mature form (animals). 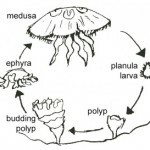 One way that this jellyfish can die if it is injured or killed during the larva or polyp stage, because in this stage it does not have the ability to revert itself back to the larva stage. How this jellyfish does this reversion is through something called transdifferentiation, which “is defined as the conversion of one cell type to another” (ncbi.gov). This ability is not to uncommon in nature, it is found in other species such as some lizards and starfish that use it to regrow body parts. It does this by using “tissue from the circulatory canal system as well as the bell surface” (ImmortalJellyfish.com). When turritopsis is injured or sick it starts by latching itself to a surface then it proceeds to do transdifferentiation throughout its entire body. Because it can do this process in its entire body it has the capability to change one cell to a completely different type of cell. For example it can take a muscle cell and change it into a nerve cell (animals). Once it does transdifferentiation throughout its entire body it becomes a blob like creature that is the larva stage. The jellyfish appears to be able to do this as many times as it wants and adult turritopsis nutriculas have been known to do this pretty often when in a lab setting (ImmortalJellyfish.com). What does this jellyfish mean for science though? While there aren’t many scientists that are working on discovering the secrets that turritopsis nutricula has or the impact it could have on humans. The ones that are however have discovered that there may be a link between this jellyfish’s immortal abilities and cancer. What allows the turritopsis nutricula to turn one type of cell into another and do the process of transdifferentiation is what are called microRNA’s or miRNA for short. MiRNA’s are genetic material that controls a gene found in cells. It acts kind of like a light switch, in that when it is off the cell isn’t defined as anything. However when you turn it on it makes the cell turn into something like nerve, muscle, or skin cells. This relates directly to cancer because it has been found that cancer cells have alterations in the miRNA (NYtimes.com). If you are able to figure out how to control these miRNAs then you might be able to take cancerous cells and turn them into something else like muscles, nerve, or skin cells. Research in this field and the link between turritopsis nutricula and cancer is limited and still in its beginning stages. A lot more research and researchers are needed in order to fully understand miRNAs in this jellyfish and how they could be the key to unlocking the cure to many forms of cancer. 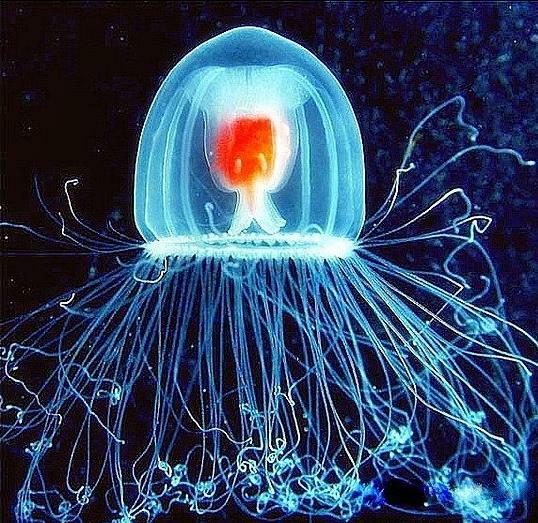 Turritopsis nutricula is not only an extraordinary jellyfish that has almost complete control over its own cells, but could help to cure cancer. This tiny jellyfishes amazing ability to virtually live forever is something that the scientific and medical community needs to recognize more. This one jellyfish has the potential to completely change how we go about curing cancer. This entry was posted in Uncategorized on October 22, 2015 by Jack Andrew Guay. This post was definitely very interesting, but I do have a question. The post mentions that the turritopsis nutricula can transform one cell into another. I found this interesting because many scientists are interested in stem cell research because they can develop into any of type of cell, and have potential to cure many different types of diseases. So would scientists be interested in using turritopsis nutricula as alternative to stem cells (which are extremely contraversial)?